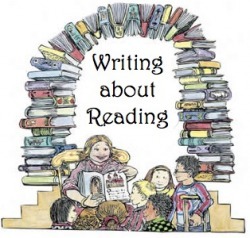 Reading response journals are a place where students respond to literature by recording their thoughts, feelings, reactions, and questions about the books they are reading. Reading responses encourage higher order thinking skills, and help students confidently share their thinking about what they read. In our reading workshop, students choose just-right books to read. They then respond to their book four times according to the following plan. 1) Pre-Reading Response: Students will glue a pre-reading page into their reading response journals for each book they read. They must then record information about the book before they begin reading: Date, Title, Author, and Pre-Reading Thinking. The pre-reading thinking should be based on examination of the blurb, cover, and table of contents. Students will also respond after the second page of the book. This pre-reading response is particularly important because the thinking that a reader does while just beginning a book will help support him/her throughout the book. Finally, students will create a plan for the three other places where they will stop and respond to their book. 2) Beginning of the Book Response: After students finish the first chapter, students will choose a question from the first part of the reading response menu (included below), and answer the question in their notebook. I picked these questions to help students think about character development and setting, make predictions, or set a purpose for their reading. 3) Middle of the Book Response: Midway through the book, students will choose a question from the middle selection on the reading response menu. These questions will help students analyze several deeper comprehension themes, including how characters change, problems in the plot, determining importance, and evaluating facts and opinions. 4) End of the Book Response: After students finish their book, students should write a final reading response. These questions focus on synthesizing the events in the book, determining main ideas, and questioning the author’s intent.